Imagine cruising the idyllic waterways of the Gold Coast and lower Moreton Bay on your own fully equipped holiday houseboat. 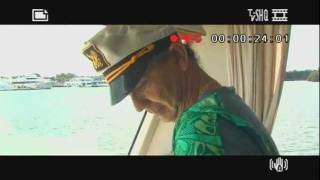 Be your own skipper with no licence needed. Take the family, friends or a romantic getaway, cruise and laze at your leisure, swim, fish, Island hop and just relax. Nice! 15 different styles of houseboats or cruisers catering for one person up to 12 persons. Boats range from a 28 foot single cabin boat to 60 foot five bedrooms with spa, air conditioning and all modern conveniences. 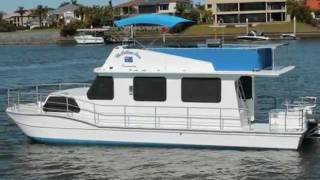 The largest range of quality houseboats and cruisers on the beautiful Gold Coast Waterways. Catering for short break weekends, midweek's or longer, seven night or 10 night charters. Perfect! Two of our entry level 12 berth houseboats ideal for two families or groups. They have four bedrooms plus temporary bedding. Roomy lounge, dining and kitchen areas with home size four burner stove and oven. Large family size bathroom. 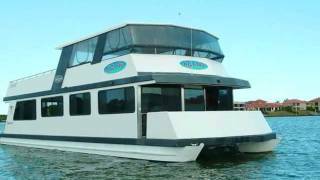 Top deck half sun half shaded semi enclosed with outdoor furniture, drive the houseboat top or bottom deck. 13.6 metres by 5.5 metres in size. 12 Berth Houseboat Ideal for eight to ten guests. Two Double Bedrooms, one with Island Bed. Two Single Bedrooms both with Double Bunks. 1 Double Pull-Out Trundle Bed. Roomy lounge dining and kitchen. Four Burner Gas Stove, Oven and Grill. LCD television, DVD, Stereo Music on both decks. Roomy Decks With Rod Holders and Bait Boards. Half covered semi enclosed sundeck with top deck helm. Barbecue and additional large Ice Box on top deck. 60 horse-power four-stroke Yamaha Outboard. Their entry level spa boat. 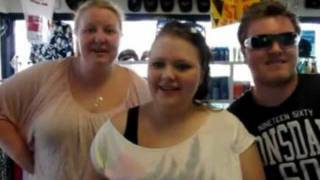 Blue Sky is the latest of the well known Billabong Spa Boat Range. She is 60 feet long, four permanent Queen Staterooms, two single bunks and a temporary double upon request. She boasts heated spa and reverse cycle air-co, dishwasher and is fitted with all mod cons including a second television and microwave on the top deck. 18 metres by 5.5 metres in size. 12 berth – ideal for 10 guests. Five person Heated Spa on upper sundeck. Four Queen sized bedrooms, two single bunks. Full ensuite to Master Stateroom. Two full size fridge freezers in deluxe kitchen. Large screen digital television, DVD and compact disc stereo. Refrigerated ice box, four sun lounges also on rear deck. Large open carpeted rear deck for fishing. Rear deck fitted with rod holders, bait board and drink holders. 12 KVA Generator with 240 volt power. Kitchenette with microwave, second television (LCD) and DVD on upper sundeck. 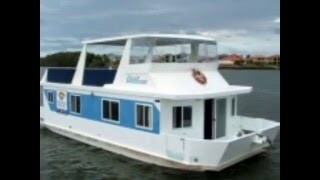 Sapphire Lady is the newest houseboat to hit the Coomera Fleet. She has been fitted with a truly modern decor which feels new and gorgeous. On the top deck you will find clears around the front to keep you out of the weather, a huge outdoor dining table and lilo’s for four. Sapphire Lady is a modern, stylish and fun 38 footer and they can’t wait for you and your crew to enjoy her. 11.5 metres by 5.4 metres in size. Two Double Bedrooms (one double has Sliding Door onto Back Deck). One Bedroom with two Single Bunks. One Double Pull Out Trundle Bed. Full Clears on Top Deck. Stereo with Music on Both Decks. Bait Board and Rod Holders. 60 horse-power four Stroke Yamaha Outboard. One of the nicest mid range houseboats in the fleet. 10 berth houseboat with two doubles, a third bedroom with double bunks and temporary bedding for four more. Paradise II has a very roomy lounge, dining and kitchen with home size stove, fridge and microwave. Top deck forward enclosed with marine covers and plenty of sun or shade room with outdoor furniture. 12.1 metres by 5.8 metres in size. 10 Berth ideal for six to eight people. Two Double Bedrooms, one with glass door to deck. One Double Pull-Out Trundle Bed. Tinted Windows For Glare Protection. LCD television, DVD, compact disc player, Stereo Fish finder. Rear Deck Shower and Rod Holders. Extra Large Icebox and Fold Down Clothes Line. Semi Enclosed Covers Surrounding Top Deck. 60 horse-power Yamaha Four-Stroke Outboard. Delivered to the Coomera Fleet as their most expensive houseboat ever, Aegean 60 boasts a delivered price tag of AUD1.9 million dollars. Manufactured with total luxury and comfort in mind and demonstrated in Aegean’s modern ‘state of the art’ features that include air conditioning, six person heated spa tub, high definition televisions, spacious top and lower decks, top deck with barbecue and alfresco dining and so much more. If it is luxury and comfort you seek as your getaway, then the Aegean 60 is the boat for you. Length 18 metres by Width 5.9 metres. 12 Berth Spa Houseboat Ideal for 10 people. Four Queen Staterooms (Master with high definition television). Two Single Bunks in Separate Forward Area. Single Bunks Convert to Lounge. Huge Modern Kitchen with Dishwasher. Twin Door Ice-making Fridge Freezer. Spacious and Comfortable Velour Lounge. Two Family Sized Full Bathrooms. High definition television viewing with Surround Sound. Modern Helm Position with high definition television/Monitor. Twin Reverse Cycle Air Conditioners. The baby of the Coomera Fleet and an awesome boat. 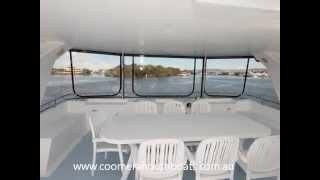 Seaview is a 36′ 8 berth cruiser style houseboat with the features you would expect from a Coomera Houseboat. Huge kitchen with four burner stove, oven and grill. Large dinette and rear lounge and a commanding helm position. Huge bathroom. Great top deck with second helm, bimini top with barbecue and outdoor furniture. 11 metres by 5 metres in size. Eight Berth ideal for four to six people. Dinette converts to Double Bed. Large Equipped Kitchen Lots of Bench Space. Large Stove, Fridge Freezer, Ice box. Spacious Dining and Lounge Area. LCD television, DVD and compact disc stereo. Stairwell to Flybridge and Sun Deck. Full Walkaround Deck With Large Duckboard. Kea Lea is the most popular boat in the Coomera Fleet. At 49 feet long, four double Staterooms, two toilets, all the mod cons and plenty of room she is the best value boat in the fleet. Huge top deck half sun half shade with ample outdoor entertainment area and furniture. 15 metres by 5.5 metres in size. 12 Berth ideal for eight to ten people. One Master Island Queen Stateroom. Second Toilet and Wash Basin. Roomy Living Area With Timber Look Flooring. 42 inch high definition television, DVD and Stereo’s Both Decks. Ice Box and Bait Board on Rear Deck. Top Forward With Clear Curtains. 100 horse-power Yamaha four-Stroke Outboard. 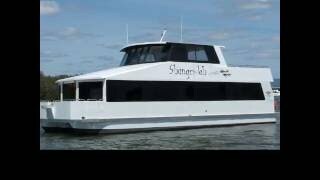 The Biggest and Most Luxurious Spa Boat on the Water. She boasts four roomy Queen State Rooms and has two Double Fold Out Sofa Beds. Largest Kitchen of the Fleet with Dishwasher and Ice Making Fridge Freezer. Top Deck has Enclosed Helm, Lounge and Bar Area and Heated Spa Top Back Deck. 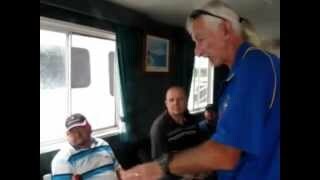 The Prestige is the only Houseboat in the Coomera Fleet with special hiring restrictions. Hirers must be 26 years of age or older and either have a boat licence or previous hiring experience, just ask them when you enquire. 18 metres by 6.5 metres in size. 12 Berth – ideal for eight to ten people. Private Balconies off Both Forward Bedrooms. Two Levels of Dining, Living and Entertainment Area. Ice Making two Door Fridge Freezer. Kitchen Complete with Microwave and Dishwasher. Two Large Screen Digital televisions, DVD and compact disc player. Ample Fully Carpeted Upper Sundeck with barbecue. Eight person Heated Spa on Upper Sundeck. 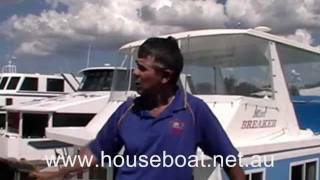 Twin 135 HP Mercury Verado Outboards. A great mid-range houseboat designed with three or four couples in mind or two families. Has four doubles and one single. Spacious L shaped kitchen giving heaps of open plan living in lounge and dining. Top deck has clear surrounds for all round weather conditions and a great sun deck with outdoor furniture. 12.1 metres by 5.5 metres in size. Modern Kitchen, Full Stove and Microwave. Cool Bright Interior With Formal Dining Area. LCD television, DVD and compact disc player with Surround Sound. Fully Carpeted Sun Deck, Outdoor Furniture. Barbecue, Ice Boxes and Rod Holders. Their only five Bedroom Houseboat with two toilets and two Levels of Living, Cooking, Dining and Entertaining areas. Perfect for larger groups and combined family parties, this vessel boasts many thoughtful additional extras to ensure your complete relaxation and comfort. 17 metres by 5.8 metres in size. 12 Berth – Ideal for 10 people. One Room with Double Bunks. Cabin Fans in two Double Staterooms. Wall Oven, Microwave, Bench Top Stove. Spacious Family Bathroom With Hair Dryer. 50 inch high definition television, DVD and Video. Separate Stereo Systems Both Decks. Top Deck Forward Enclosed for Helm Operations and Entertainment Area. Top Deck has high definition television, Microwave, Barbecue, Wok Burner and Dining area. Ice boxes Throughout, Fishing Rod Holders, Bait Boards and Clothes Line. 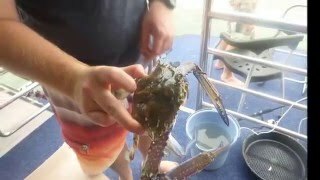 Reversing Camera and Intercom to Top Deck. 115 horse-power Yamaha Four Stroke Outboard. 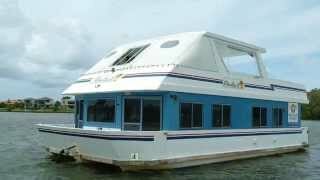 Keiko is a beautifully appointed eight berth houseboat and the most modern houseboat in the Coomera Fleet. She boasts large kitchen and lounge area, alfresco dining top and bottom and fourseparate bedrooms with two separate toilets. Keiko is spacious and well appointed inside and out with roomy and well furnished deck spaces. 14 metres by 5.5 metres in size. Eight Berth Houseboat with Comfort. Al Fresco Dining Top and Lower Decks. One Bedroom with Double Bunks. Second Powder Room and Toilet. Modern Style and Fit out. Large Screen LCD television and DVD. Stereo Music to all Decks. Roomy Decks With Rod Holders and Bait Board. Covered Sundecks Forward and Top Deck. Barbecue and Outdoor Dining Front Deck. Additional Large Ice Box on Top Deck. Top Deck All Weather Clear Curtains. A modern wide body fibre-glass flybridge cruiser that looks more like a private cruiser then a hire boat. Aristocat has a functional compact galley, dining and three separate cabins. Top flybridge is huge and protected with clear curtain surrounds and gives a commanding view of the waterways. 9.1 metres by 5 metres in size. Seven Berth Ideal for five people. Fully Equipped Galley Granite Look Bench Top. Three Burner Gas Stove, Oven and Grill and rear deck barbecue. Marine Style Bathroom and Toilet. Large Rear Deck with Wraparound Seating. Shangri-Lah is one of the roomiest most spacious houseboat in our fleet and the only houseboat with a King Size Stateroom. She has extra high ceilings giving you space to stretch out, all staterooms have full walk around beds, second toilet and an enclosed second helm and entertaining area upstairs. Shangri-Lah is a modern and stylish spaceship. One King Island Bed Master Stateroom. Three Queen Island Bed Staterooms. One Double Pull-Out Double Trundle Bed. One Temporary Double on Request. Roomy High Ceiling Lounge, Dining Area. Modern Kitchen, Cooktop, Wall Oven. 50 inch Plasma television, DVD and Stereo to Both Decks. Top Deck Enclosed second Helm, barbecue, Dining and Entertainment Area. Two Huge Ice Boxes Top Deck. Live Bait Tank and Rod Holders. 10KVA Onan Genset 240 Volt Power. 115 horse-power Yamaha four-Stroke Outboard. A fully refurbished 38 foot seven berth cruiser with popular full walk around decks and a roomy comfortable interior. This boat presents as ‘Brand New’. Duel steering top and bottom, carpeted flybridge area with outdoor furniture and barbecue. Powered by a single 60 horse-power four-stroke outboard motor. The Colleen Ann is a popular choice. 11.5 metres by 4.9 metres in size. Seven Berth Cruiser Style ideal for four to six people. Nautical Wood Grain Finish Throughout. High definition television and Full Sound System Both Decks. Large Size two Door Fridge Freezer. Four Hot Plate Stove With Oven and Grill. Rod Holders and Bait Board. Great Flybridge Top Deck Area.